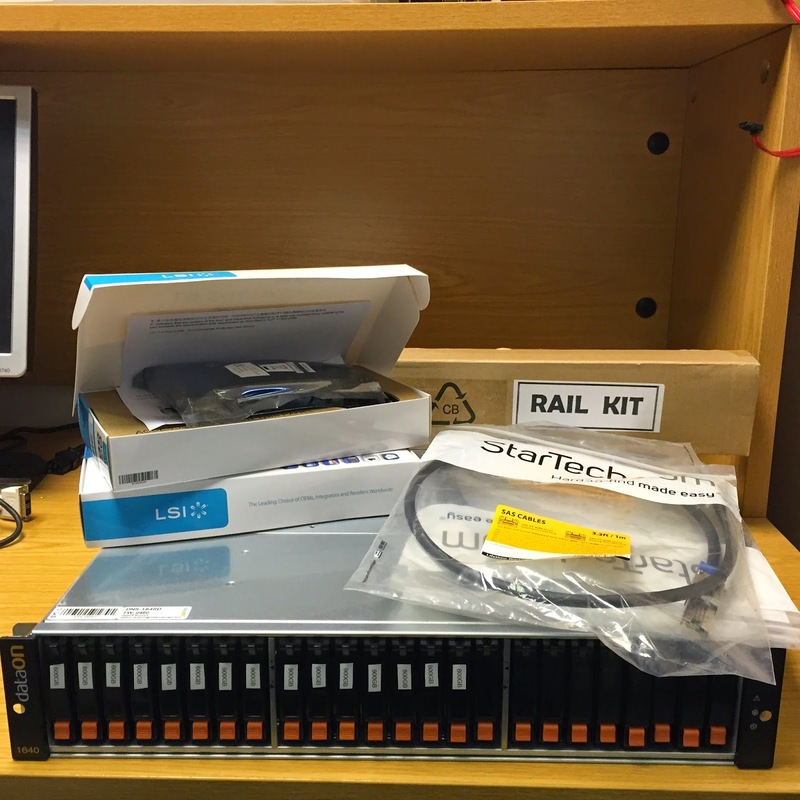 At work we have been investigating storage solution based on Microsoft Scale Out File Server and Storage Spaces. We have just managed to scure on loan a DataOn 1640 for test and evaluation along with a selection of disks, cables and HBA's all courtesy of VA Technologies. We are evaluating this both for internal use and for client deployments. Utilizing Storage Spaces and Scale Out File Server we hope to supplement our HP SAN and Starwind software based solutions we are currently offerings our clients. These together with the servers currently in our normal lab enviroment should make for a pretty speedy storage solution. Over the next couple of weeks I will be posting on how the trial goes, and conclusions reached. Hi, How is your Lab test going? I am curious how you are planning to do monitoring of physical disk-status/errors, PSU, fans and other major monitoring services of DataOn JBOD. We did not find any (SNMP) features to monitor de DataOn. Now we do some monitoring of the disks over the LSI’s but this is not (far from) optimal and also causing (false positive) errors when rebooting one of de SOF’s for maintenance. Performance of DataOn with Storage spaces is very good. We have 16x1TB 10K Toshiba SAS HD’s an 8 200GB Seagate SAS SSD, we are happy with the performance and quality, only advance monitoring is causing us worry. I hope to hear from your lab experience, thanks! Things have gone well thanks, I think we will be adding them to our storage solution tool box. You are right that monitoring is an issue, in fact to the best of my knowledge that do not provide much in the way of monitoring at all so fans and PSU's are an issue. I know in a production environment they recommend three enclosures to alow for the total failure of a whole enclosure but you still need to know when its happened! I assume you have installed Hotfix 2913766 which gives a bit morw in the way of monitoring although mainly through Powershell and SMAPI. It might also be worth looking at the link below, it not really disk monitoring but it is useful for storage cluster health. Performance has been very good for us too although this is for us secondary to good up time and the easy of management. Thank you for your comment, if I can be of any further help let me know. I will discuss this with my tech and look into your tips. On traditional SAN you get way more storage Health info we would like to have with DataOn and Microsoft Storage Spaces. It would be nice if DataOn would develop a Storage Space Cabinet 2.0 with SNMP monitoring features to read state and (predictive) failures on Physical Disk, SAS-controller, PSU, FAN's, Temp, etc. So we get info right from de box. If I can be of further help just let me know. I think its possible they may add PSU, fan and temp monitoring but I doubt they would add disks as they are really just passed through to the os. Also some of those features may require custom disk firmware which is something the DataON products help you get way from.